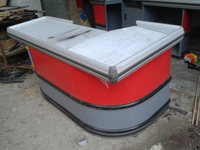 Cashier - Buy Cash Counter table, Checkout counter, Money Desk Product on Suzhou Ownace Commercial Equipment LTD.
1)Color:Red, Black (RAL/PANTONE colors are available). 2) Package: Standard export package of wooden case or high quality carton , safe enough for long-distance transportation. 4)Surface finishing: Plastic powder coated. Protection against the tide and sun. 5)Top board: Polished stainless steel and strong aluminum alloy border. 6)Border:Aluminum alloy border or aluminum plastic border for choice. 7)Firm and stable structure, nice and neat apperance, popular among markets both at home and abroad. 8)We can provide accessories such as shopping bag holder, keyboard holder. 9)Special design of the computer protection cover can make for you. 10)It can match with keyboard holder, hooks, etc. Excellent for use in hypermarket, warehouse etc. 1.We supply high quality products with reasonable price. 2.We are the professional manufacturer with advanced production machines. 4.We have professional sales team. 5. Experienced exporting for all over the world. 6.We supply one-step solution service.